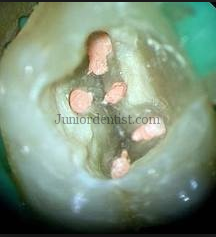 Removal of gutta percha is done in failed RCT cases where re-treatment of root canal therapy is required. Retreatment is mainly required to either reshape and obturate a canal with voids or in case of peri apical pathologies arising due to improper BMP of canal where remnant infection causes the infection to reoccur. Most commonly used material for obturation is guttapercha which is an inert material and is obturated into the canal by lateral condensation, vertical compaction, thermal obturation and injection technique. The removal procedure of guttapercha is the same for any type of obturation technique and i have listed the various types in which gutta percha is removal from a failed Root canal treated tooth. After removal of Gutta percha the canal is cleaned properly and if any remaining Infected Pulp tissue is present is removed and Re treatment is done. Hi dr.varun can you send me full article plz.